Chiffon Cake. I just love the name “chiffon”. Before making this cake, I honestly didn’t even know what a chiffon cake was. My Grandmother's Betty Crocker Cookbook has lots of variations of the chiffon cake, including maple pecan, pineapple, chocolate chip, spice, bit o’ walnut, holiday fruit, cocoa, peppermint chip, cherry nut, and banana. And the main recipe for chiffon cake is lemon. The cookbook also gives directions for making large cakes as well as for making small cakes. The butterscotch version caught my eye. Plus brown sugar was on sale this week at grocery store. And when I read that the recommended frosting for this recipe was penuche frosting, I knew I had to make it. So what exactly is a chiffon cake and what makes it different from other cakes? The difference is that the egg whites are beaten and added separately from the yolks. This cake also uses oil (or as it is referred to in the cookbook--salad oil) instead of butter. This makes the “light as an angel food, rich as butter cake.” The cookbook also describes the cake as the “first new cake in a hundred years”, and that got me wondering about the history of the chiffon cake. Wikipedia says cake was created in 1927 by Harry Baker, a California insurance salesman and caterer. It became popular in Hollywood, but the recipe was kept a secret for 20 years until it was sold to General Mills and released to the public in a Betty Crocker pamphlet. I guess it was quite the cake to make in the 1950’s! For the butterscotch version of the chiffon cake, the directions are to omit 1 1/2 cups of white sugar in the original recipe and substitute 2 cups of brown sugar. The recipe didn’t specify how to pack the brown sugar in the measuring cup. Usually recipes state “firmly packed” or “packed”. Since the 2 cups of brown sugar were replacing 1 1/2 cups of white sugar I did not firmly pack the brown sugar . And I guess it is a good thing that I didn’t because as the cake was baking I paged through the cookbook and found a section in it on how to measure ingredients. It says to pack the brown sugar just enough to hold its shape. This is different than many recipes which require firmly packed brown sugar. It also states that if the brown sugar is lumpy, to press through a coarse sieve or heat in a “slow” oven, or to crush lumps using a rolling pin. The cake has a fairly mild flavor which works well with the penuche frosting. I really like the texture--it is tender, moist, and airy. I have never cared for angel food and sponge cakes, but I do like this chiffon! I look forward to trying some of the other versions, especially the lemon. 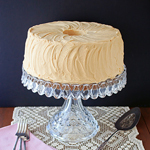 A chiffon cake and penuche frosting recipe from my grandma's cookbook. 1. Sift together the cake flour, sugar, baking powder, and salt; then add the brown sugar to the dry ingredients and mix to combine.2. Make a "well" with the dry ingredients then add the oil, egg yolks, cold water, and vanilla and beat until smooth.3. In a separate bowl add the cream of tartar to the egg whites and beat until they have very stiff peaks; don't underbeat.4. Carefully pour the egg yolk batter over the surface of the beaten egg whites.5. Gently fold the egg whites into batter by bringing a scraper from the bottom of the bowl, up the sides, and over the batter until completely blended.6. Pour into ungreased 10" (4" deep) tube pan and bake for 55 minutes at 325°F and then for 10-15 minutes at 350°F.7. Invert cake and let it hang upside down until completely cooled.8. Loosen sides with a knife or spatula, then turn pan over and knock pan to release cake. 9. To make penuche frosting, stir all ingredients over low heat until combined then bring to a full boil, stirring constantly. Boil for 1 minute then remove from heat and beat until it is the right consistency to spread on the cake. 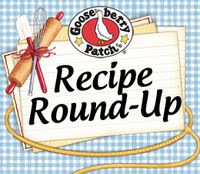 Recipe adapted from Betty Crocker's Picture Cookbook, First Edition, McGraw-Hill Book Company, Inc. and General Mills, Inc., 1950. This looks so good and your photo is beautiful. I really need to take a food photography class. Where on earth did you find that lovely cake plate? I've never had a butterscotch cake but so long as it's mild like you say, I'm sure I will love it. By the way, nice icing! The cake plate was given to me by my mother-in-law. I think it was one of her aunt's. The funny thing is that my mom has one just like it, and I believe that one was my grandma's. I have a few other pieces that match as well. I guess it is Fostoria American pattern. This chiffon cake is lovely. Funny I had never wanted to try these cakes but am glad I finally did. Butterscotch flavor is not one you see used very much and I am glad you made this flavor your choice. Wonderfully unique and no doubt delicious. My goodness, Jill, this cake is gorgeous! I love the whipped look of the frosting, butterscotch is so delicious! Well, it is a gorgeous cake! You did the frosting like a pro. I'm sure it tastes delish and yes, I'd love to try the lemon! Thanks so much for sharing. I thought I was already a follower but didn't see 'me'. I am now! Jill-Your cake is stunning! I've never had a butterscotch cake, but I'm sure that it is delicious. Such a gorgeous presentation. BEAUTIFUL!!! What a gorgeous cake...perfect crumb and iced so artfully. And it looks darn tasty, too! This cake is just gorgeous! I love the frosting and of course, all that butterscotch! That is one gorgeous cake (and cake plate). I love butterscotch anything and this cake sounds heavenly-- esp. with that icing! Stunning cake! My father loves lemon chiffon cake and every once in a while I break out my cookbook and make it for him...I, however, would MUCH prefer butterscotch! absolutely stunning! I love love love the cake stand! That's the most gorgeous cake I've ever seen. It looks so daunting but I would love to try it sometime...if I can work up the courage! This looks like it belongs in a magazine! So beautifully done, from the baking to the photography! Wowowowo , gorgeous looking cake , it looks amazing and also the beauiful cake stand , just wowowo :) . This cake is absolutely stunning! An aesthetic and culinary achievement! The texture is perfect looking, not to mention the presentation! Jill...what a beautiful light cake. I can't wait to try it. And I love your styling...love your cake server and forks....everything is just beautiful! What a lovely cake. I've never made a chiffon before. Hi Jill! I remember my mother making the angel food, sponge and chiffon cakes. She iced her cakes exactly as you did in the photo! Butterscotch is a delightful surprise chiffon cake flavor! The penuche icing looks so good and I feel I remember this name. Do you think butter would work in lieu of shortening in this icing? Can't wait for your lemon version! Thanks! Thank you everyone for your comments :) It was a surprisingly easy cake to make! I tried to make the pictures look like something out of a 1950's cookbook. I'm not sure if I achieved that or not, but that's what I was going for. Bonnie--I was tempted to substitute butter in the frosting, but since I hadn't made it before I followed the recipe. Now that I have tried it, I do think butter would work and add a nice flavor. When I make this again, I will definitely substitute butter for the shortening. If you try it with butter, let me know how it turns out! Jill, your chiffon cake is absolutely elegant, and gorgeous. You can tell it's an oldie, but "goodie" just from the butterscotch frosting, with the shortening. Your cake looks lovely, and the penuche frosting definitely sold me on it! Such a BEAUTIFUL cake! It looks so moist and fluffy! I love it! I have never had chiffon cake before, but I love how it looks! And penuche frosting is delicious! I agree with everyone, the cake looks beautiful and sounds yummy. They say presentation is everything and your place setting is beautiful as well. I love your flatware, your dishes, and especially your cake plate. Your table runner adds that special touch and those pink napkins enhance the color of the cake. I love that this was your grandmother's recipe! Super sweet. And I had never heard of penuche before! Your picture is stunning and I am sure the cake was fluffy and amazing! Thanks for sharing the history of Chiffon cake with us, it's quite fascinating to find out how so many of our foods came into the public palate. As the your cake, yes, please! Especially because it's butterscotch! One of our sisters-in-law makes a butterscotch pie to die for, but I think a butterscotch cake would be even better! Truly beautiful. I love how you frosted it. I could really go for a piece right now. Just found you through the YBR. Great post! Both your photos and cake look absolutely gorgeous! One day perhaps I'll learn to decorate a cake like you do. Thanks for participating in September's YBR :) Sorry I'm so late in getting here. Penuche frosting? Yum! I have only had it in fudge form and cannot wait to try it in frosting form. What a great recipe. Is this cake too soft to use in a layer cake? Can I bake it in a different type of pan? I have not tried it in a different pan, but the original recipe says it can be baked in a 9"x13" pan at 350F for 45 - 50 minutes. My guess is that 2 9" round layer pans would also work fine with baking time adjustments. Because the pan is not greased (so the cake can "hang" upside down) a bundt pan or other shaped pan would not work well.